Location: Mailhoc, in the Tarn departement of France (Midi-Pyrenees Region). 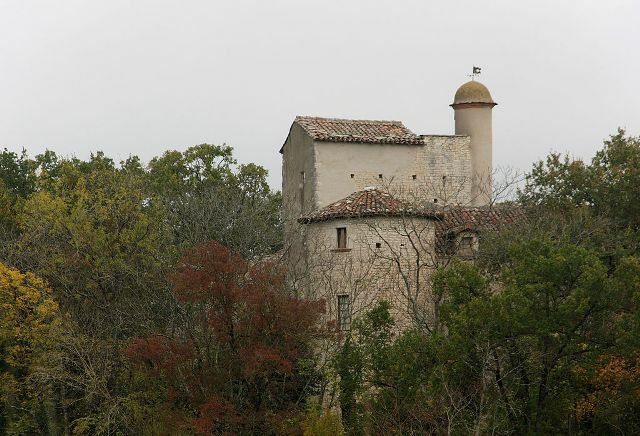 Notes: Château de Mailhoc is a castle located in the eponymous town in the Tarn, France and registered as historical monuments since July 13, 1927. The first written reference that is preserved is an act of co-lordship of the son of the lord of Penne in 1227. the castle has a strong rectangular house look like it flourished during the hundred years war in all border areas between crown of France (Albi) and crown. (Rouergue) The old round towers have suffered too much further work to be dated accurately. The three wings date from the early sixteenth century and during the wars of religion, the castle is in the hands of Philip of Rabastens, Protestant leader ravaging the area. It improves comfort of the castle that takes Renaissance paces. This hand to hand at the discretion of marriages, inheritances and sales and works dated from 1764 on a lintel, are performed. During the Revolution, while the owners have emigrated, the castle was ransacked. It was at this time that the towers are shortened at the facades. In the nineteenth century, there were pieces of walls of the outer enclosure. The quadrilateral is flanked by four cylindrical towers with flat tile roofs. The sides are those of three wings of the castle and a wall on which rests a gallery overlooking the courtyard. A staircase serves the floor. The facades are fitted with transom windows. The set has been little subsequent major changes..